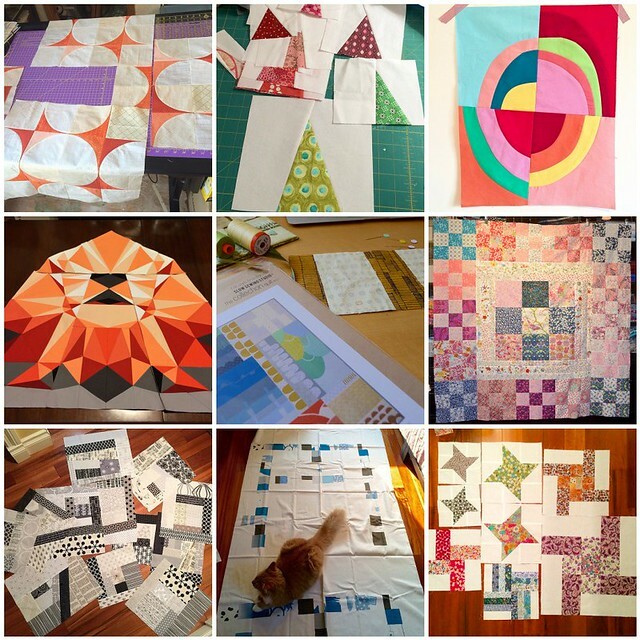 she can quilt: 2016 Q1 - Link to post your list to finish is open! 2016 Q1 - Link to post your list to finish is open! It may be difficult to believe but here we are....the first Quarter of the 2016 Finish-A-Long.Thank you to the wonderful Adrianne, from On The Windy Side who hosted the 2015 FAL and to all of you for participating in 2015. For the 2016 FAL, we will have the return of a tutorial week at the end of each quarter, between the opening of the link for finishes and the day that link closes, so stay tuned for more on that at the end of Q1. If you have a tutorial that you would like to share, please let me know. It's time to round up those projects you want to finish over the next three months, take a photo of where you are now, and make your list. Please ensure that you have at least started your projects - pulled fabric with a pattern or plan, and remember that it is finished projects that will count. So while we love to see your bee blocks, the "finish" is when they are a completed, quilted quilt. The 2016 Q1 link for your list of proposed finishes is now open below on my blog and on each of the hosting blogs. You only link your list once, on one blog - and that link will show up on all of the blogs. If you are using Flickr or Instgram, link a mosaic and put your list in the description. Katy of The Littlest Thistle has a great tutorial on how to link-up if you have need it. Orange Twirl Quilt - this is new to this blog, but I have been sharing it on Instagram. I hope to get the pattern done too. Liberty Blocks - there are more blocks in Nicky's pattern but I might just take the blocks I have an make a quilt or maybe I will make more. I figured while I had the Liberty fabrics out for the medallion, I should finish these off too. Well, 9 projects in 3 months might not be that focused, but wish me luck. Now its your turn. Get those lists together and get linked up. The Q1 linky party will stay open until 11:00 pm EST, January 16th - as we are global, you might want to check your time zone to determine your last possible time to link. Oh and you can like the 2016 FAL on Facebook here and follow us on Instagram @finishalong, and tag your progress and your finishes #2016FAL. I'll be interested to see how the focussed list works for you - I've gone for a scatter gun approach! Good luck, I can't wait to see more of all these projects, especially Orange Twirl! Great projects Leanne! I'll be changing my tactics for this year as well, lol. I'm just now looking for the quilts to finish and link up soon. Yours are so bright and beautiful. My favorites are number 3 and 7. Number 3 reminds me of the sami flag. I'm so impressed, Leanne. 9 projects in 3 months! I will be cheering you on! Yeah I remembered to link up :) That's the first step! Your projects look gorgeous - the Orange Twirl quilt is going to be stunning! Im excited to finish so projets.